No surprise here. Simple bait and blame. Obama is taking the right stand for the time being. 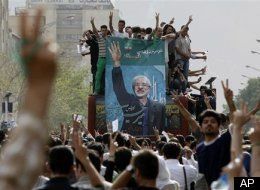 He shouldn’t play into Ahmadinejad ‘s or Khamenei’s hands. Besides, a strong hand right now by the U.S. might actually turn off the Iranian street. I venture they want freedom and world support, but likely don’t want to look like U.S. shills either. They need to establish their own autonomous voice. This entry was posted in Iran, lifestyle, news, Politics, Uncategorized, war and tagged Huffington Post, HuffPost, IranElection, livebloggin, Tehran, video, world news by allenshadow. Bookmark the permalink.